Let's continue HP QTP training series with our next QTP tutorial #4 – Adding Conditional and Loop Statements in Keyword View. Understanding QTP keyword and expert view feature in detail is very important to learn QTP. So we have divided this Keyword View tutorial into four articles. This is the third article in Keyword View series. basic example where we recorded a series of simple operations on the Sample Flight Application. This aids in understanding how QTP translates the steps performed by the application into a table with 4 essential columns of the Keyword view. Not only does QTP show the user the operations performed in terms of a table but also lets the user manipulate the steps from this very table. We have explored how a standard step can be added to the keyword view. Apart from a standard step, this view also displays the conditional and loop statements in a test. In this article, we are going to explore how QTP’s Keyword view handles these statements. Firstly, what do Loop and If statements do? Loop Statement: This is a part of programming logic that is used when a particular set of statements have to be executed repeatedly for a particular number of times. Another variation of this statement is to repeat execution for a block of code until a certain condition is satisfied or while the said condition is satisfied. Keyword view has a different icon to indicate each of these statements in the keyword view. Let’s include some dummy steps into our program and see how these statements appear in the keyword view. For convenience and since the steps that I am about to insert are a dummy, I am going to put the code directly into Expert view and we observe it in keyword view. The above is the different variations of the ‘if’ statement that I entered in the expert view and as I said all the code does not serve any purpose except for our understanding. We will note how these statements are represented in the keyword view. As you can see each statement type is given a different icon for identification. Let’s look at how these statements are represented. We will follow the exact method that we did for the conditional statement. For my examples above I have added the conditional statements from the Expert view and we merely looked at their representation in the Keyword view. So far we have not added them directly from the keyword view. Keyword view does provide a way for these statements to be added directly to the test. Here is how you can do it. As you can see above, An If..Then, Elseif..then, Else are the statements that can be chosen based on the requirement of the tester. Let us choose an ‘if..then’ and see what happens. This is what gets inserted. Now, just the way we would do for a standard step, we will need to define a conditional statement too. Item: Click on the ‘item’ column corresponding to the ‘if’ statement and all the objects available will be displayed. This feature again is no different from the standard step definition. So choose an object that you wish to act on. As an example, I am going to check if the ‘Password’ field exists. So I choose “Password” from the list. Value: The argument/arguments for the function is what this field is. For the ‘Exist’ function an argument is not necessary so we will leave it empty. Let us now look at how this new statement looks in the keyword view as well as what it looks like in Expert view. As you can see, the ‘if’ statement is defined. Now, we have to add code or statements to define what needs to be done if the condition becomes true. For the sake of our example, if the password box exists we will enter a value in the field. How can we accomplish this? 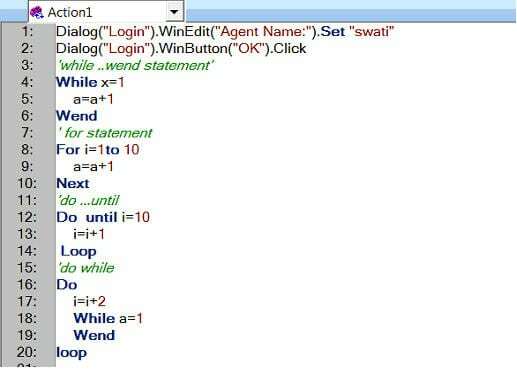 Once a conditional or loop statement has added any steps that the user adds or records will be directly added to them unless explicitly specified. The statement added or recorded could be a standard step or another conditional or loop statements (nesting). So, to define the ‘Then’ part of our ‘if’ statement, I am going to record the action of entering the password value. To do so, I will choose ‘Record’ from the menu options and enter a password value in the ‘Flights’ Login page. Take a look at the screenshots below, the recorded statement got directly added under the ‘if’ statement. Any steps you add further will be added under to the ‘if..then’ block. The new step just comes as a sibling to the ‘if’ block. Now, that we have understood the basic functionality it goes without saying that all the other conditional statements work the same way and any of them can be used as needed by the programmer’s logic. The procedure to add the loop statement is by right-clicking in the keyword where you want it inserted and choosing “Insert New Step->Loop Statement” and the required option. As always, the inserted step has to be defined. Any steps recorded or added after the loop will be within the block and to exit the block the user has to explicitly specify that the new step is to be added outside the block by right-clicking on the loop statement and choosing “Insert New step after block” option. Let us add a ‘For’ Statement as an example. In the value column, I will set the iterator value. I set it as 1 to 3. Next, I added a statement as “msgbox “x””. Let’s look at how this looks in the keyword view. So, that concludes our session on the conditional and loop statements and how they can be inserted from the keyword view. If or loop statements can be pretty much added just the way a standard step is added. Just like a standard step these steps also need to be defined. Steps that are recorded or added after a block statement will be added to the block by default unless specified. When a statement has to be added outside the loop we need to choose the option “Insert new step after block” option from the right-click menu after choosing the block after which we desire the steps to follow. In the next session, we will explore more options of the keyword view such as moving and deleting steps, adding and deleting breakpoints. good one.. simple explanation for loop and condition statements. Nice and simple overview…. good for beginners…. keyword view but the “If-else” and “If – elseif ” options are not enabled . Could you please tel me why its though? Great article. – The “Adding condition statements to the keyword view” cleared up an important query. In addition the “if block” information clarified another issue. I have started reading this website from yesterday. It looks great for basic understanding. I am into testing field from last 2 and half years. My question is simple. Will this full tutorial help me in cracking job interview based on automation with QTP??? I tried following in QTP. But while running it’s showing following Run Error dialog box. Line (5): “If Dialog(“Login”).WinEdit(“Password:”).Exist() Then”. I have started reading the articles from this website from last couple of days. I have one question after reading all the articles. Will it be suffice? Will I be able to start automation testing after having knowledge giving in ur articles. I am not able to figure it out . Can u please help me .